A pair of confirmed tornadoes touched down in Illinois this week. 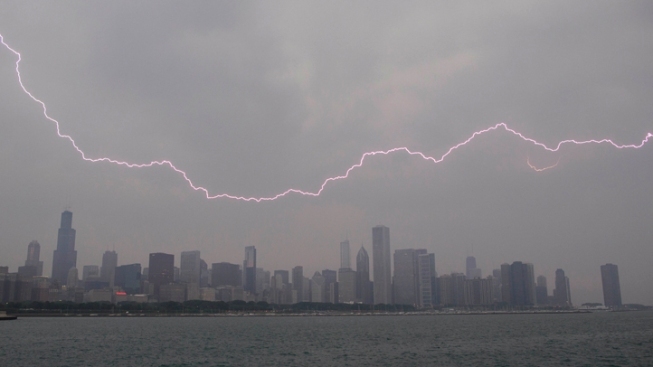 Lighting flashes over the Chicago skyline, Wednesday, June 12, 2013. An unusually massive line of storms packing hail, lightning and tree-toppling winds was rolling through the Midwest on Wednesday. The National Weather Service confirms two tornadoes touched down in northeast Illinois this week as a line of severe storms hit Illinois. The first tornado made land contact at 4:32 p.m. near Shabbona, damaging crops and knocking down trees throughout the area. The second tornado touched down at 7:50 p.m. and was very short-lived in Kankakee County, according to the National Weather Service. The storms caused plenty of headaches throughout the area. Besides numerous downed trees, more than 30,000 Commonwealth Edison customers lost power Wednesday evening, Metra temporarily suspended trains and commuters experienced massive backups on roadways. More than 360 flights were cancelled at O'Hare International Airport. For a time, all inbound flights to O'Hare were kept at their origin. Midway International saw another 50 cancelations. A barn collapsed in south suburban Manteno, leaving 10 horses trapped. Nine of them were rescued. Neighbors, family and firefighters dug through mud and debris to free nine trapped horses after powerful winds tore through a barn in south suburban Manteno. Hail the size of a quarter was seen near Aurora as the storm progressed toward Chicago. In Lemont, lightning was blamed for a massive house fire that severely damaged the home.